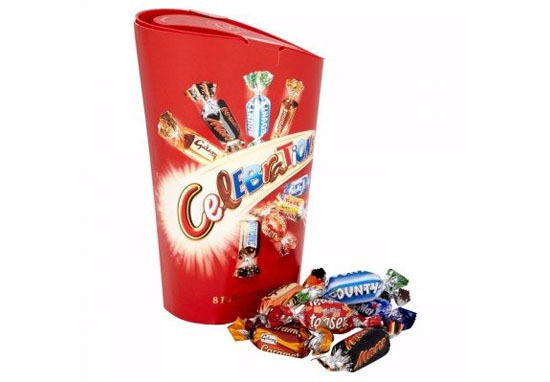 Great news if you’ve not done your Christmas shopping yet, bad news if you have – take all your presents back to the shops, because Celebrations boxes are going to include Milky Way Crispy Rolls – any other present this year has now been deemed worthless. The act of Christmas shopping has just got 5,000,000 times easier – all you need to do is go down to your supermarket and load up on tubs of these guys. Forget thinking about what you’re going to get your family and friends – if you’re one of those people who does that – if you really exist? @joshbythesea this is not a drill…. The Germans have had Crispy Rolls in their Celebrations for a while, and without trying to sound like Jeremy Clarkson it looks like we’ve now caught up with our friends in ze continent. Eagle-eyed chocolate watchers on Twitter were the first to catch on to the news. As if tiny little Mars, Bounty, Snickers, Galaxy, Maltesers and Twix bars weren’t enough to make you forget all your sorrows this year, the inclusion of the Milky Way Crispy Roll is surely enough to pull you from the edge of any It’s A Wonderful Life like situations? The cruel twist though is the standard Milky Way has been replaced. Win some, lose some, I guess? I've just found out that Milky Way Crispy Rolls are now going to be one of the sweets in tins of Celebrations. Hello 40% body fat over Christmas ? If anyone’s feeling generous, feel free to send a tub my way.